Easily turn your home’s water supply on or off from your smartphone, tablet, or computer if you’re going away for the night. This is especially useful if your valve is located in a basement or crawl space or if you left for the weekend before turning it off. 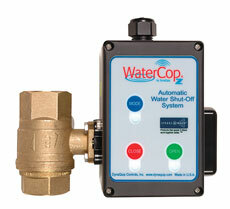 When paired with a Water Sensor, your Water Shut-off Controller will automatically shut off your home’s water supply as soon as a leak is detected to prevent flooding.